In the final game of the 2015 regular season, the Blue Jays and Tampa Bay Rays would face off one last time. The Rays would be looking to play spoiler for the Jays as a win, and a Kansas City loss, would put the Jays on top for the best record in the American League. Mark Buehrle would be sent to the hill in what could be his final appearance in the MLB as the 16-year veteran is contemplating retirement during the off-season. 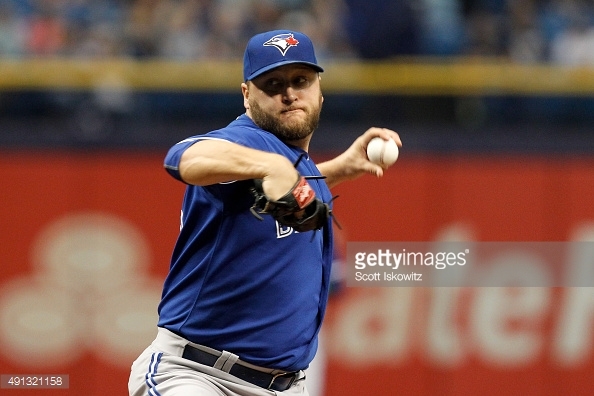 Buehrle was standing two innings shy of having another 200IP season. Looking to reach this milestone, Mark would be only the fifth player in MLB history to reach 200+ innings, in 15 consecutive years. Things did not go as planned in this fairytale ending however. The Tampa Bay Rays would send ten to the plate, scoring nine including a grand slam at the hands of Joey Butler. The grand slam would also be the only GS hit at Tropicana field this season. So Buehrle would fall shy by four outs to reach the historic plateau. After coming to the bench, he was thoroughly thanked by each of his teammates as no one is certain whether he will be returning next season. The Jays would go on to lose in similar fashion 12-3 as they did earlier this season in the trop at the hands of the Rays. Kansas City would go on to win their contest, ending their season two games ahead of the Jays for best record and home field advantage in the ALCS if the to clubs were to face each other. The Toronto Blue Jays will now have three days off before beginning their ALDS match-up at the Rogers Centre versus the Texas Rangers. The Jays won their regular season matches against the Rangers 4-2. Although it has not been formally announced, it appears that David Price will be the starter for the Jays in Game 1 Thursday as the Rangers look to possibly send Yovani Gallardo to counter.